Practitioner perspectives on the role of Spatial Big Data in retail decision making. scheduled on Wednesday, 4/5/2017 at 8:00 AM. scheduled on Thursday, 4/6/2017 at 8:00 AM. scheduled on Thursday, 4/6/2017 at 10:00 AM. A Local Spatial Market for Upscale Retail in Canada? scheduled on Thursday, 4/6/2017 at 13:20 PM. Location and Temporal-Spatial Understanding of Canadian Inventions: 1991-2016.
scheduled on Friday, 4/7/2017 at 13:20 PM. scheduled on Saturday, 4/8/2017 at 10:00 AM. scheduled on Sunday, 4/9/2017 at 8:00 AM. scheduled on Saturday, 4/8/2017 at 13:20 PM. The above list does not include roles as session organizer, session chair, or panelist, which you will find detailed in the conference program. As an international student, I was facing some bureaucratic hurdles obtaining an internship in Canada. However, my program, the BA in Geographic Analysis, requires the completion of 350 hours of work experience, usually on paid practicum placements in the private or public sector. Given the need to complete this requirement for timely graduation next spring, my attention shifted to my home country, Russia. I was able to arrange an internship with ESRI CIS, the Russian subsidiary of the world-leading Geographic Information Systems (GIS) vendor, ESRI Inc. The placement in Moscow was arranged through the help of networking and contacts I made during the 2015 International Geographical Union conference in Moscow, which I attended as well. During my placement between May and July 2016, I have obtained valuable experience which shaped my sense of the work environment of a large GIS vendor. I was attached to the GIS specialist team and my supervisor helped me a lot on the first stages of my placement. I was introduced to my project, which involved creation of a massive geo-database coordinated by ESRI software packages, particularly ArcMap 10.2 and ArcCatalog 10.2. I was tasked with data mining routines, maintaining attribute tables and working with relational databases. The project focused on the transformation of polygonal data into a geo-database according to technical standards, which were set by a client. Once the routine workflow was formed, ESRI offered me a choice of attending additional ESRI certified training courses, from which I completed two: ESRI ArcGIS 10.3 Essential Workflows and ESRI ArcGIS 10.3 Effective Editing. Both courses helped to solidify my skills in editing polygonal data and conduct analyses using geoprocessing tools. Working in an environment with experienced professionals in the GIS field, especially programmers involved in the creation of Web GIS scripts, helped me improve my GIS programming skills, including those, which facilitate and automate routines related to attribute information editing. Overall, my summer internship at ESRI CIS allowed me to practice and deepen the essential skills of a GIS specialist, which will come as an asset in my employment search in Canada. I also spent some time exploring my hometown – visiting museums and suburbs – and traveling to the neighbouring Baltic countries Latvia and Estonia. 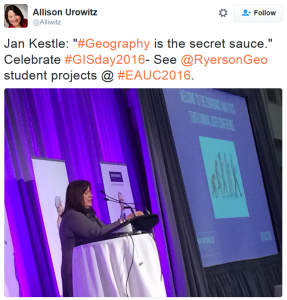 For GIS Day 2016, the Department of Geography and Environmental Studies joined forces with Environics Analytics, “Canada’s premier marketing and analytical services company”. This year’s Environics Analytics User Conference on November 16 attracted 675 data analysts from 350 organizations and featured 16 client presentations, numerous software demos, and one great party! 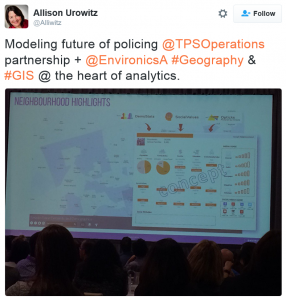 The core role of Geography and location in data analytics was emphasized by many presenters. Environics Analytics founder and president, @statslady Jan Kestle, is quoted with identifying “Geography as the secret sauce” that integrates data for advanced analytics. 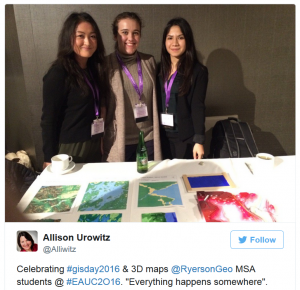 The Department of Geography and Environmental Studies at Ryerson University received shout-outs and accolades for training the next generation of data analysts through its BA in Geographic Analysis and MSA in Spatial Analysis programs. We joined the Environics Analytics User Conference with a GIS Day-themed display of geovisualization projects from the MSA cartography course and with a 15-year reunion to celebrate the 2001 class of MSA graduates, the first-ever group of students receiving a graduate degree from Ryerson University. Since then, over 300 students have obtained the MSA degree and joined the ranks of data analysts, who shape the regional economy, public services, and environment. A timeline of all conference-related tweets can be found at https://storify.com/ClausRinner/geography-the-secret-sauce-of-data-analytics. Thank you, Allison Urowitz (@alliwitz), for the pertinent tweets reproduced above. The Urban and Regional Information Systems Association (URISA) held its first conference on “Urban Planning Information Systems and Programs” in 1963 at the University of Southern California. Now dubbed “GIS-Pro”, the conference and URISA as an organization are the preeminent destinations for exchange of best-practices among Geographic Information Systems (GIS) professionals. This year, Canada, the birth place of GIS, welcomed URISA back for its 54th annual conference held at Toronto’s Westin Harbour Castle hotel from Oct 31-Nov 3, 2016. The conference drew over 350 participants, with some 200 from Canada (including 150 from Ontario) and most of the remainder from the United States. Representatives from Australia, Barbados, Japan, Malaysia, Republic of Korea, Saudi Arabia, South Africa, and the United Kingdom rounded out the pre-conference attendee list. URISA is greatly engaged in the professional development of its members, and consequently, over 100 participants held the GISP designation. URISA is a founding member of the GIS Certification Institute, which awards the “GISP” status and was an exhibitor and workshop organizer at the conference. URISA’s Vanguard Cabinet of young geospatial professionals, URISA’s GISCorps of worldwide GIS volunteers, its GIS Management Institute, and its regional chapters were all involved in organizing the conference. In one of the conference highlights, Esri Canada founder and president Alex Miller was inducted to the URISA GIS Hall of Fame. More information about URISA can be found at http://www.urisa.org/main/about-us/. Ryerson’s Department of Geography and Environmental Studies attended the conference with three speakers and ten student volunteers. In the unusual format of a luncheon presentation and discussion table (https://gispro2016.sched.org/event/6nuR/hosted-lunch-vendor-spark-lunch-presentations-roundtable-discussions), I presented work with Dr. Claire Oswald on “3D-Printed Geography for Education, Outreach, and More?” This was a summary of one-and-a-half years of 3D-printing of terrain models and cityscapes, focusing on the processing of geospatial data into 3D printer-compliant format, and on the reception of this project among potential users such as conservation authorities. 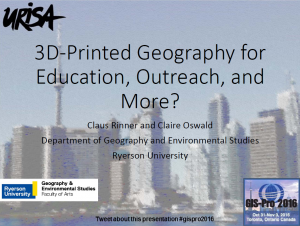 Our slides are available at http://gis.blog.ryerson.ca/files/2016/11/3d-printed-geographies_urisa-gispro2016.pdf. A previous review of the project is available at https://storify.com/ClausRinner/3d-printed-geographies-one-year-in. My former graduate students Justin Pierre and Richard Wen had signed up for a session on open-source geospatial software (https://gispro2016.sched.org/event/6nv7/free-puppies-and-solutions-open-source-and-commercial-software). Justin presented on his Master of Spatial Analysis (MSA) major research paper “Developing an Argumentation Platform in an Open Source Stack”. His map-based discussion forum on Toronto’s bike lane network runs on Ryerson’s cloud at https://cartoforum.com/bikelanes/, albeit not always as reliably as we wish. Richard outlined his MSA thesis research on “Using Open Source Python Packages for Machine Learning on Vector Geodata”. He applied the “random forest” algorithm to the task of detecting outliers in OpenStreetMap data, with the goal of developing tools for semi-automated data input and quality control in volunteered geographic data. Richard’s code and thesis are available at https://github.com/rrwen/msa-thesis. Both of these student were part of the Geothink SSHRC Parternship Grant, http://geothink.ca/, which supported their conference participation. @RyersonGeo also had a booth in the GIS-Pro 2016 exhibit hall. 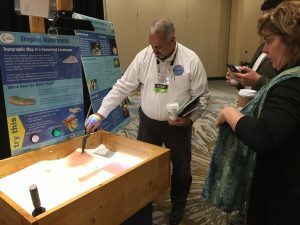 While conference participants were interested in the Department’s programs and research expertise, the main attraction of our booth was an augmented-reality (AR) sandbox. The sandbox was built, set up, and staffed by our collaborators in the GIS team at the Central Lake Ontario Conservation Authority (CLOCA – http://cloca.ca/). 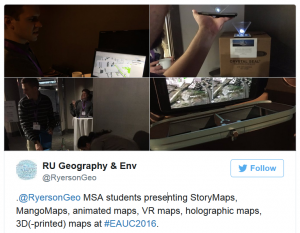 CLOCA staff had attended Dr. Oswald’s GeovisUW workshop (https://storify.com/ClausRinner/geovisuw-workshop-ryersongeo) in June 2016 and were inspired by the visit of Ryerson’s Digital Media Experience Lab, which demo’ed an AR sandbox. In subsequent discussions about public outreach around surface- and groundwater protection, we proceeded with 3D-prining of CLOCA’s watershed geography and terrain, while CLOCA staff endeavoured to build the sandbox. The two displays were used by CLOCA at the 2016 Durham Children’s Groundwater Festival in late September. At the GIS-Pro 2016 conference, some participants were wondering about combining the two technologies, while others were interested in using the sandbox to model real-world terrain and simulating flooding. While accurate modeling of terrain and water flow may prove difficult, we are indeed planning to test the sandbox with semi-realistic scenarios. In conclusion, applied GIS researchers and practicing GIS professionals are a friendly, close-knit group. The conference volunteers from our BA in Geographic Analysis, BA in Environment and Urban Sustainability, and MSA in Spatial Analysis programs were given a lot of free time and thoroughly enjoyed the conference. They were truly impressed by the large number and variation in GIS applications presented, and left the conference with a greater sense for the professional community. For me, the conference confirmed that research and development of GIS should be led by geographers, within Geography departments, as we are best positioned to understand the professional end-user’s needs, yet also have the technical expertise, at least @RyersonGeo, to contribute to GIS R&D. 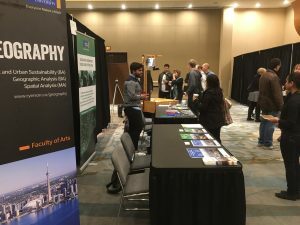 This past week, URISA held its 54th annual GIS-Pro conference in Toronto, bringing together GIS professionals and businesses from around the world. The conference provided many interesting sessions including one focused entirely on open data. This session, titled “Leveraging Open Data” (https://gispro2016.sched.org/event/6nun/leveraging-open-data), included government as well as private sector perspectives. The session began with a presentation from the Government of North Carolina, discussing the importance of metadata. They are currently collaborating with a number of agencies to create and share a metadata profile to help others open up their data and understand how to implement the standards suggested. They have produced a living document which can be accessed through their webpage http://nconemap.com/DiscoverGetData/Metadata.aspx. The Government of Ontario was also present as this session, presenting on the current status of open data for the province. The Ontario Government promotes an Open by Default approach and currently has over 500 datasets from 49 agencies available to download through their portal at https://www.ontario.ca/search/data-catalogue?sort=asc. They are working towards continuing to increase their open datasets available. A presentation by MapYourProperty (http://mapyourproperty.com/) provided an interesting perspective from the private sector using open data to successfully run their business. They heavily depend on visualizing open data to provide a web-based mapping application for the planning and real estate community to search properties, map zoning information and create a due diligence report based on the information found. This is one example of many that exist in the private sector of open data helping build new companies, or help existing companies thrive. Lastly, a representative from Esri Canada’s (http://esri.ca/) BC office wrapped up the session reminding us all of the importance of opening data. This included highlighting the seemingly endless benefits to open data, including providing information to help make decisions, supporting innovation, creating smart cities and building connections. Of course, open data is big business for Esri too, with the addition of ArcGIS Open Data as a hosted open data catalog to the ArcGIS Online platform. Hello, pokemon trainers of the World! Today, I would like to explain Geographic Analysis using the ideas of the Pokemon GO game that you know only too well. I hope that you will return to the game with a good understanding of the geographic concepts and the geospatial technology behind it. Safe for some serious cheating, you have to move around this thing called THE REAL WORLD with your location-enabled device in order to “catch’em all”. Smartphone producers make it really difficult to manipulate GPS location, because it is such a critical function of your device. So, unless you are truly close to that poke stop, you won’t be able to access its resources: free poke balls, razz berries, etc. In Geography, we often study the location of points-of-interest or services. For example, if you live or work close to a specific shopping mall or hospital, you are likely to use their services at one point or another. Or, if you are far away from a college or university and still choose to pursue higher education, you may have to move in order to be within reach of that institution. To use a poke stop or gym, or to catch a pokemon, you do not need to be at their exact coordinate locations, but you need them to appear within your proximity circle as you move around. In Geographic Analysis, we often examine this “reach”, or catchment area, that is defined by proximity to locations of interest. For example, when a coffee chain looks to open a new store, Geographers will examine their competitors’ locations and surrounding neighbourhood profiles to determine whether there is a gap in coverage or whether there are catchment areas that include enough people of the right demographic to support an additional cafe. In Retail Geography, we call these areas “trade areas”. That’s why you can find clusters of Tim Horton’s, Second Cup, and/or Starbucks at major intersections where the geodemographics are favourable – yes, this is likely a Geospatial Analyst’s work! And that’s also why you can find clusters of poke stops in some of your favourite busy locations. To support business decision-making, AKA “location intelligence”, Geographers use data on population, household incomes and employment, the movement of people, and the built environment. If you have ever “watched” pokevision.com for different locations, you will have noticed great variation in the pokemon spawn density and frequency. For example, in our screenshots below you can see tons of pokemon in downtown Toronto, but not a single one in an area of rural Ontario. Similarly, there are dozens of poke stops and several gyms within walking distance in the City but a lone poke stop in rural Ontario. The Pokemon GO vendor, Niantic, seems to be using geodemographics in determining where pokemon will spawn. They make it more likely for pokemon to spawn where there are “clients”: that is, yourselves, the trainers/players. Geographic space is a unique dimension that critically influences our lives and societies. The spatial distribution of people and things is something that Geographers are studying. Just like the spawning of pokemon in general, the appearance of the different types of pokemon is not randomly distributed either. For example, it has been shown that water-type pokemon are more likely to appear near water bodies. 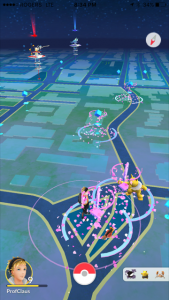 See all those Magicarps near the Toronto lakefront in the screenshot below? A few types of pokemon even seem restricted to one continent such as Tauros in North-America and won’t appear on another (e.g., Europe). 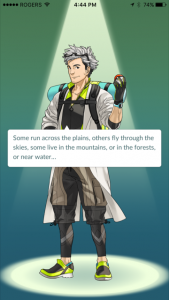 The instructions by “Professor Willow” upon installation of the app actually refer to this regional distribution of pokemon. I also believe that the points-of-interest, such as buildings, that serve as poke stops, determine the pokemon type spawning near them. 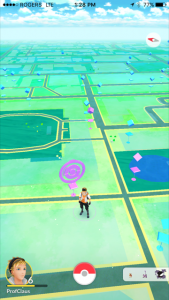 For example, the Ontario Power Building at College St. and University Ave. in Toronto regularly spawns an Elektrabuzz, as shown in the last screenshot below. In Environmental Geography, we often analyze (non-pokemon) species distribution, which is also not random. The availability of suitable habitat is critical, just like for pokemon. In addition, spatial interactions between species are important – remember the food chain you learned about in school. I am not sure that different pokemon types interact with one another; maybe that could be the topic of your first course project, as you enter a Geography program at university? The techniques that we use within Geographic Information Systems (GIS) include suitability mapping, distance and buffer analysis, and distance decay. Distance decay means that it is becoming less and less likely to encounter a species as you move away from suitable habitat. Or in the business field, it is becoming less and less likely that people will shop at a specific mall the further away they live from it. A buffer is an area of a specified distance around a point, line, or polygon, just like the proximity circle around your pokemon avatar. GIS software can determine if other features are within the buffer around a location. Instead of enabling access to poke stops or gyms around your avatar, Geographers would use buffer analysis to determine which residents have access to public transit, e.g. if they are within walking distance of 500m or 1km of a transit stop. A final thought about how Pokemon GO has brought Geography to the headlines concerns important professional and societal challenges that Geographers can tackle. These range from map design and online map functionality to crowdsourcing of geospatial data, as well as the handling of big data, privacy concerns, and ultimately the control of people’s locations and movement. 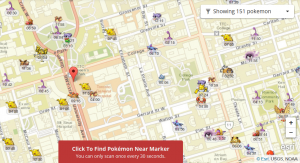 The now-defunct pokevision.com Web map used Esri online mapping technology, one of the world-leading vendors of GIS software and promoters of professional Geography. 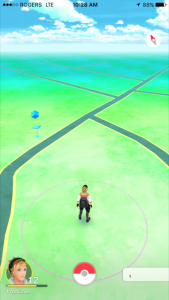 Another approach, which is used by pokemonradargo.com, has trainers (users) report/upload their pokemon sightings in real-time. This geospatial crowdsourcing comes with a host of issues around the accuracy of, and bias in, the crowdsourced data as well as the use of free labour. For example, poke stops were created by players of a previous location-based game called “Ingress” and are now used by Niantic in a for-profit venture – Pokemon GO! Finally, you have all read about the use and misuse of lure to attract people to poke stops at different times of day and night. 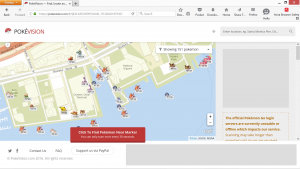 The City of Toronto recently requested the removal of poke stops near the popular island ferry terminal for reasons of pedestrian control and safety. Imagine how businesses or government could in the future control our movement in real space with more advanced games. I hope I was able to explain how Pokemon GO is representative of the much larger impact of Geography on our everyday lives and how Geographers prepare and make very important, long-term decisions in business and government on the basis of geospatial data analysis. Check out our BA in Geographic Analysis or MSA in Spatial Analysis programs to find out more and secure a meaningful and rewarding career in Geography. And good luck hunting and training more pokemon! As a follow-up to my post on “Geospatial Data Preparation for 3D Printed Geographies” (19 Sept 2015), I am providing an update on the different approaches that I have explored with my colleague Dr. Claire Oswald for our one-year RECODE grant entitled “A 3D elevation model of Toronto watersheds to promote citizen science in urban hydrology and water resources”. The tools that we have used to turn geospatial data into 3D prints include the program heightmap2stl; direct loading of a grey scale image into the Cura 3D modeling software; the QGIS plugin DEMto3D; the script shp2stl.js; and a workflow using Esri’s ArcScene for 3D extraction, saving in VRML format, and translating this file into STL format using the MeshLab software. Being a GIS specialist with limited knowledge of 3D graphics or computer-aided design, all of the techniques used to make geospatial data printable rely heavily on the work of others, and my understanding of the final steps of data conversion and 3D print preparation is somewhat limited. With this in mind, the first approach to convert geospatial data, specifically a digital elevation model, used Markus Fussenegger’s Java program heightmap2stl, which can be downloaded from http://www.thingiverse.com/thing:15276/#files and used according to detailed instructions on “Converting DEMs to STL files for 3D printing” by James Dittrich of the University of Oregon. The process from QGIS or ArcGIS project to greyscale map image to printable STL file was outlined in my previous post at http://gis.blog.ryerson.ca/2015/09/19/geospatial-data-preparation-for-3d-printed-geographies/. The use of the heightmap2stl program in a Windows environment requires a somewhat cumbersome process using the Windows command line and the resulting STL files seemed exceedingly large, although I did not systematically investigate this issue. I was therefore very pleased to discover accidentally that the Cura software, which I am using with my Lulzbot Taz 5 printer, is able to load greyscale images directly. 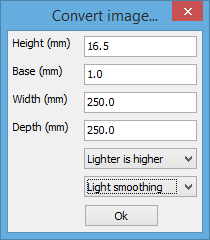 The following screenshot shows the available parameters after clicking “Load Model” and selecting an image file (e.g. PNG format, not an STL file). The parameters include the height of the model, height of a base to be created, model width and depth within the available printer hardware limits, the direction of interpreting greyscale values as height (lighter/darker is higher), and whether to smoothen the model surface. The most ‘popular’ model created using this workflow is our regional watershed puzzle. The puzzle consists of a baseplate with a few small watersheds that drain directly into Lake Ontario along with a set of ten separately printed watersheds, which cover the jurisdiction of the Toronto and Region Conservation Authority (TRCA). Both of the first two approaches have a significant limitation for 3D printing of geography in that they do not support controlling geographic scale. To keep track of scale and vertical exaggeration, one has to calculate these values on the basis of geographic extent, elevation differential, and model/printer parameters. This is where the neat QGIS plugin DEMto3D comes into play. 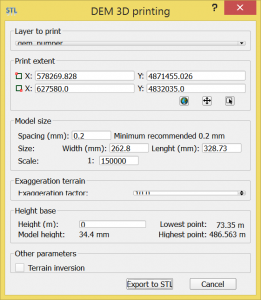 As can be seen in the following screenshot, DEMto3D allows us to determine a print extent from the current QGIS project or layer extents; set geographic scale in conjunction with the dimension of the 3D print; specify vertical exaggeration; and set the height at the base of the model to a geographic elevation. For example, the current setting of 0m would print elevations above sea level while a setting of 73m would print elevations of the Toronto region in relation to the surface level of Lake Ontario. One shortcoming of DEMto3D is that vertical exaggeration oddly is limited to a factor of 10, which we found not always sufficient to visualize regional topography. Using DEMto3D, we recently printed our first multi-part geography, a two-piece model of the Oak Ridges Moraine that stretches over 200km in east-west direction to the north of the City of Toronto and contains the headwaters of streams running south towards Lake Ontario and north towards Lake Simcoe and the Georgian Bay. To increase the vertical exaggeration for this print from 10x to 25x, we simply rescaled the z dimension in the Cura 3D printing software after loading the STL file. The DEMto3D plugin strictly requires true DEM data (as far as I have found so far), thus it would not convert a Shapefile with building heights for the Ryerson University campus and surrounding City of Toronto neighbourhoods, which I wanted to print. Additionally, the approach using a greyscale image of campus building heights and one of the first two approaches above also did not work, as the 3D buildings represented in the resulting STL files had triangulated walls. In looking for a direct converter from Shapefile geometries to STL, I found Doug McCune’s shp2stl script at https://github.com/dougmccune/shp2stl and his extensive examples and explanations in a blog post on “Using shp2stl to Convert Maps to 3D Models“. This script runs within the NodeJS platform, which needs to be installed and understood – the workflow turned out to be a tad too complicated for a time-strapped Windows user. Although I managed to convert the Ryerson campus using shp2stl, I never printed the resulting model due to another, unrelated challenge of being unable to add a base plate to the model (for my buildings to stand on!). Another surprise find, made just a few days ago, enabled the printing of my first city model from the City of Toronto’s 3D massing (building height) dataset. This approach uses a combination of Esri’s ArcScene and the MeshLab software. Within ArcScene, I could load the 3D massing Shapefile (after clipping/editing it down to an area around campus using QGIS), define vertical extrusion on the basis of the building heights (EleZ variable), and save the 3D scene in the VRML format as a *.wrl (“world”) file. Using MeshLab, the VRML file could then be imported and immediately exported in STL format for printing. While this is the only approach included in this post that uses a commercial tool, ArcScene, it is likely that the reader can find alternative workflow based on free/open-source software to extrude Shapefile polygons and turn them into STL, whether or not this requires the intermediate step through the VRML format. In Search of the Mother of GIS? My thoughts on Panel Session: 1475 Gender & GIScience, at AAG 2016. I recognize that it is impossible to undo the deep-rooted masculinization that has persisted in GIScience. However, we can change how we address it moving forward. Let’s recognize that we don’t need a father (or mother) of GIS; we need leaders, visionaries, and mentors of all shapes, sizes, colours, backgrounds, and genders. I challenge all those who are GI Professionals in training to look for the untold story, the hidden history of GIS, and the little-seen influences on the discipline. I challenge those who teach GIS to go beyond the ‘truth’ presented in the textbooks. And lastly, I want to conclude by saying thank you to the powerful female mentors on this panel and ones not represented here; mentors who transcend the need for a ‘Mother of GIS’.